As we move into the holidays and start planning the 60-day sprint, I am reflecting on what has helped me through crunch times and sprints this year. HOPE made a difference. In October, I was blessed to speak at the Kitsap County Resilience Summit. The keynote speaker was Chan Hellman Ph.D. from the University of Oklahoma. For the last decade he has been researching hope with individuals with high ACES (Adverse Childhood Events Scores). His new book, Hope Rising: How the Science of HOPE Can Change Your Life, will be available on Amazon in late November. I highly recommend it! Here is a summary. He distinguishes hope from wishes. “Hope is the belief that a thriving future is possible and that you have the power to make it so. A wish is something that has no steps towards making it real and that you don’t have any influence over.” (p31 Hope Rising). So let’s set our goals and raise our HOPE to get through the holidays with a little more self-compassion and self-care, and enter the new year with renewed resilience. So what are your holiday hopes? Do you have steps identified along a path to achieve them? Are they really goals that you, personally, want for you or your family? Which ones are you sure of? Which ones do you need to strengthen your Hope Plan around? 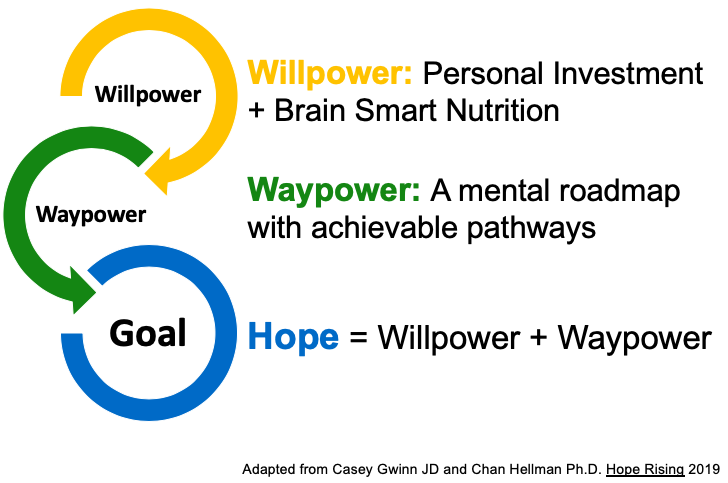 For those who want to learn more, here is a link to a presentation given by Chan Hellman on this topic, titled Pathways of Hope. He also has a number of videos on YouTube.